Join your host, Kim Saeed, as she discusses the neuroscience of narcissistic abuse and recovery with Dr. Rhonda Freeman. Dr. Freeman is a Clinical Neuropsychologist licensed in Florida since 2000. Dr. Freeman earned her PhD in psychology, specializing in neuropsychology, from Drexel University. 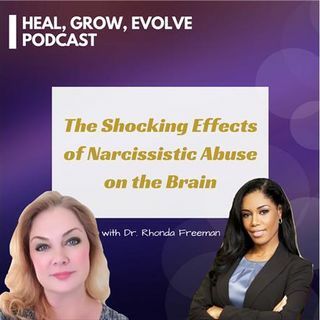 In this episode of Heal, Grow, Evolve, Kim and Dr. Freeman discuss the effects of narcissistic abuse on the brain, whether you can heal while still in a toxic relationship, why it’s so important to ... See More exit toxic situations when children are involved…and many other dynamics related to the neuroscience of narcissistic abuse recovery. Visit Kim's blog at https://letmereach.com/ to learn more about narcissistic abuse and recovery, as well as to gain access to free downloads, checklists, and healing resources. Want to be a guest on the Heal, Grow, Evolve podcast? Click here to indicate your interest.